The Holy Father, Benedict XVI, is a man of fervent prayer. In his statement announcing his resignation from the Petrine Ministry due to his advanced age, he pointed out that he had finally made this serious decision after a long period of prayer and extended reflection. He is deeply aware that in order to fulfill his papal duties, he cannot rely on word and deed alone, but also needs prayer. He entrusts the future of the Church to the Lord Jesus and to our Blessed Mother. After he resigns, he will serve the Church wholeheartedly through prayer. We express our heartfelt thanks to the Holy Father, Benedict XVI, for his guidance and good example, and we will always pray for him. We have profound faith that both the resignation of the Holy Father, Benedict XVI, and the selection of his successor, are in the wise hands of Divine Providence. 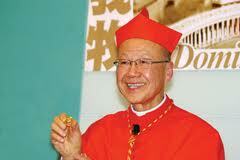 May all of us Catholics in Hong Kong pray for the smooth election of the next Pope. We firmly believe that the incoming Pope will lead the Church according to the holy will of the Lord Jesus and ecclesial tradition, and that he will continue the proclamation of the Gospel, to bring salvation to the whole human race. This is also the objective of the Year of Faith which we are now celebrating.